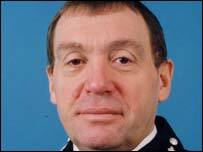 Cumbria's Chief Constable has retired after 38 years in the police force. Michael Baxter, who was appointed in 2001, stepped down on Friday and will now take up the role of chief executive of the Northern Police Charities. Under his command the force supported a proposed merger with Lancashire constabulary, only to back out of the plan later. He joined the police in 1969 as a constable in the Leeds City force in West Yorkshire. Between 1976 and 1994 he was promoted through the ranks and worked in a range of roles from uniform to vice squad and CID. Mr Baxter said: "I have thoroughly enjoyed the challenges of the last five years and I feel that I am leaving at a time when the constabulary is strong and well positioned for the future."